The 6 Bar vapour steam vacuum cleaner is our compact 2 in 1 machine, consisting of a steam cleaner and vacuum on a easy to move trolley. 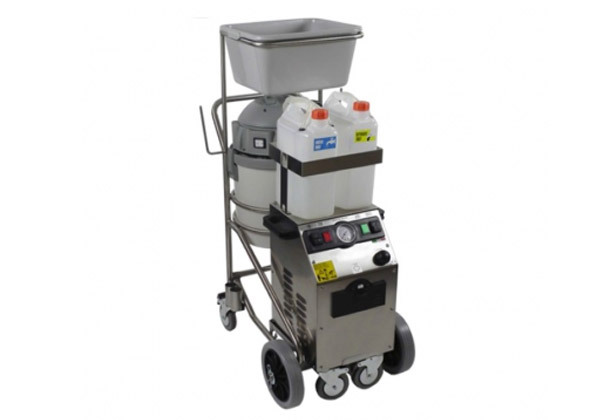 The steam cleaner can be used as a stand alone machine that’s easy to carry and works in the tightest spots or can be placed into its dedicated vacuum trolley for steam and vacuum applications. The steam section is engineered to run continuously or on demand, you choose, and is available with a selection of accessories and hoses to suit your needs. Ideal for many applications including restaurants, rest rooms, hotels, gum removal and schools.